Reflecting on these many years as a Dominican, my heart is filled with gratitude for God’s gracious call to live with passion and grace this most amazing Mystery. And what a gift, to do so with all who have been and are my contemplative companions in the Holy Preaching – Laus Deo! at St. Anne’s Parish and attended St. Anne School and Catholic Central. She was the middle child between a sister and brother. She had aunts and cousins in religious life, so an early interest was always there. As a tenth grade student, she was invited to visit Marywood for the profession of the sister of a classmate. That visit awakened with clarity the call to Dominican life. After high school Nancy entered the community in 1965. She earned an MA in Religious Education at Aquinas, an M.Div. from St. John’s (now Sacred Heart) Seminary in Detroit and a D.Min. in Spiritual Direction. She taught elementary school for 17 years and loved the 7th and 8th grade students in particular, and also served six years in school administration. Interest in spirituality led her to an internship in the Spiritual Exercises with Jesuits in Detroit and Retreat/Spiritual Direction ministry beginning in 1981. Nancy had a passion for awakening adults to the fire of the Holy Spirit in their daily lives. 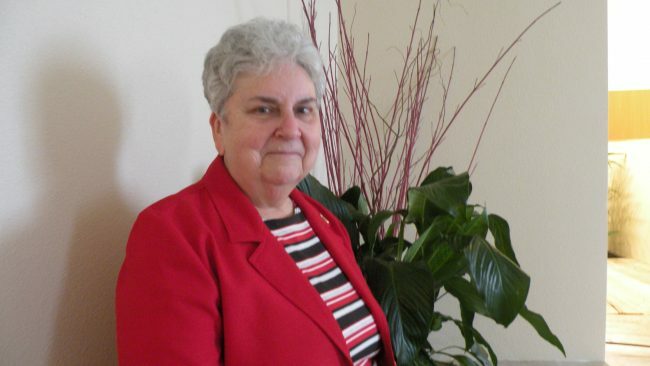 This ministry led her to Des Moines, Iowa as Director of St. Joseph Educational Center and then to Dominican Center at Marywood for eleven years offering spiritual formation opportunities at both of these centers and elsewhere. Her experience of doing group spiritual direction with the street people of the Heartside Neighborhood in Grand Rapids is published in “Group Spiritual Direction: The Lived Experience” by Paulist Press. In 2009, she was invited by the Lutheran Synod, ELCA to become Facilitator of Living Fire Ministries offering retreats, spiritual direction, workshops and programs in prayer, spirituality and spiritual formation for the Synod and for other churches and organizations. She was truly enlivened by this ecumenical work. The group of Christian, Muslim and Jewish members offered many dialogue/dinner events for the community. In 1997, Nancy began designing and leading annual international pilgrimages to Europe and the Middle East as part of the spiritual formation programming. She delighted in opening this way of the contemplative study of saints and mystics. Sister Nancy’s pilgrimages are a blessing to all who travel with her to learn and pray with the mystics. Here, she leads prayers in the Abbey where Thomas Aquinas died in 1274.